I think I enjoyed that more this time around than I did on original broadcast, which is surprising. It isn't the most original of plots, but it does get the right balance between pace and character I think. It doesn't feel like padding when there are quiet, talky bits and there's a lot of exposition dumped in entertaining ways. It never feels rushed or forced. 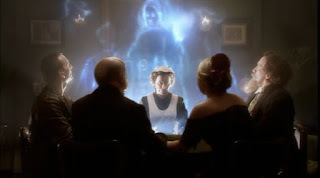 The Gelth, who are the ethereal blue villains of the piece, have been victims of the Time War. This is the first time we hear a long-ish explanation of the Time War and The Doctor's guilt clearly motivates his actions. Rose even picks him up on it when she tells him not to use Gwyneth (Eve Myles) to fight his battles for him. We also get hints that The Doctor meeting Rose has helped him in the post-Time War shock he is suffering from. This is a theory of mine, so I could be reading too much into it but the post-regeneration, post-Time War trauma has basically re-Time Lorded him. He's back to Hartnell pre-Ian and Barbara. Rose brings him back from that and gradually Doctors him up again - and that Tennant's very human Doctor is the result. It's a theory. I raise it only for academic interest. Christopher Eccleston is mostly excellent in this, although I still don't think he's as comfortable with some of the more light-hearted stuff. It feels a little forced sometimes but perhaps that's a deliberate choice. I think though my favourite moment is the short scene with Gwyneth right at the end. It's rather lovely and again Eccleston shows most of his responses with minimal gestures. I always think this video ( Proof - I Am Kloot ) shows Eccleston's expressiveness off best. But I digress. Billie Piper's good too. Her desire to protect Gwyneth from both the monsters and The Doctor is nicely played as is her telling off Sneed (the excellent Alan David). Her reaction to stepping out into the past, like her future shock in the previous episode, is convincing. Sadly, the longer Doctor Who runs the less this gets shown until companions become quite blasé about the whole thing. It requires the occasional minor character to do the 'shock and awe' bit. Simon Callow does Charles Dickens, which is nice. I like that his reaction to the events is to be given a new lease of life and that this parallels the Doctor's re-emergence from the Time War. (OK, I'll shut up now). Eve Myles is brilliant as Gwyneth with her second sight and faith. Her scenes with Billie Piper are great but the best must be when she steps in to the conversation between the Doctor and Rose that's effectively about her. The danger with writing people from the past is making them stupid because they don't know things. Lack of knowledge doesn't make you stupid, just uninformed. Mark Gatiss does a good job avoiding this in his script. Two quibbles: firstly, the Doctor's panic when trapped towards the end doesn't quite ring true. The Doctor always believes there's a way out. He might struggle to find it, but he never stops looking for it. In this story he flaps and descends into self-pity. It doesn't quite feel right. Secondly, was it necessary to go completely unsubtle with the Gelth at the end. Ooh, they're evil now let's make them red and demonic. It's laying it on with a trowel in my book. Quibbles aside though I enjoyed this.